Bashar Stencil by El Teneen. Next to it, reads ‘The People Want the Downfall of the Regime’ words made famous in Tahrir. Sighted on July 25th, 2011. The graffiti has since been painted over. One of the things that we Egyptians have in common with Syrians is our democratically elected rulers’ penchant for killing their own people – only Syria’s Bashar El Assad has thrown caution (and chummy relations with the morally conscious Western governments) to the wind by attempting to wipe out all of the people who don’t like him. I think he’s learned Mubarak’s lesson – kill under 1000 and you’ll end up on a stretcher in a cage. So, kill tens of thousands and get away with it. QED. When Syrian tanks and troops began mobilizing in the rebel stronghold cities of Hama, Deir Zor and Daraa and killing unarmed civilians in the first days of Ramadan, the graffiti stencil of Bashar El Assad became even more relevant. 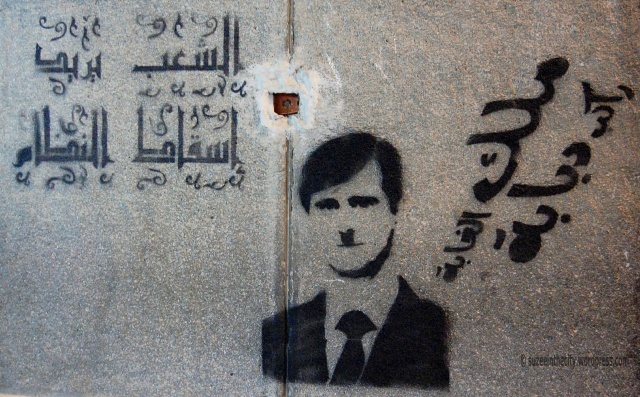 Sighted on the walls of the Mogammaa’ building in Tahrir on July 25th, 2011, the stencil depicts El Assad as another Hitler, something that passersby in the square immediately recognised and connected to. Next to it reads ‘Malek El Ghaba, Rakeb Dababa’, an almost childish chant that literally translates into ‘King of the Jungle Rides the Tank’. The concept was a simple collaborative effort between Egyptian graffiti artist El Teneen and his Lebanese contemporary, who’d rather remain anonymous. Show your solidarity with the people of Syria. Denounce the tyrant turning his forces on his own people. Spread the word. Or in this case, the stencil. After having finalised the design together, El Teneen made the stencil on the Mogammaa walls. 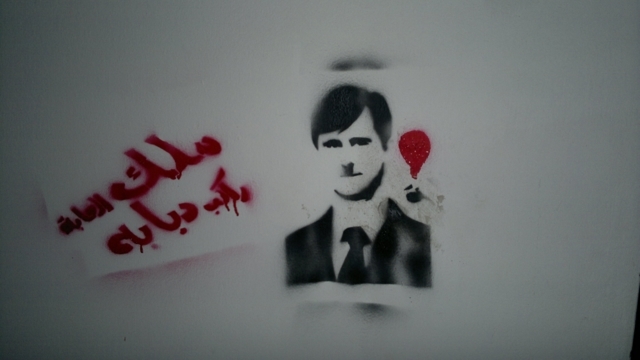 Days later, on August 3rd, the Bashar stencil appeared on the walls of El Hamra in Beirut, and was photographed by blogger BeirutWalls. Dubai-based blogger Hanibaael wrote that the neighbourhood of El Hamra is struggling to maintain its identity as a liberal and lively neighbourhood in the face of growing undercurrents of the Baath regime. Testament to that is the fact that the stencil has since been sprayed over, according to BeirutWalls’ August 10th blogpost. Stencil sighted on wall in Beirut’s El Hamra neighbourhood on August 3rd, 2011. The stencil has since been sprayed over. Photo courtesy of beirutwalls.wordpress.com. Sharing an idea makes it fluid, you can’t stop it, or contain it; all it takes is a few Facebook messages, an email here or there, and then the graffiti appears on the walls of Gaza on August 9th. You’d think that the people of Gaza have enough on their minds to care about the massacre in Syria. Just like the people back home here in Egypt, who mutter about the wheel of productivity and the bite of bread (sounds much fancier in Arabic) when you ask them about the dying and dead in Syria. There is a growing sense of revolutionary fatigue in Egypt; but that shouldn’t stop you from acknowledging the atrocities committed in Syria and your basic humane instinct to feel compassion for the desperate and defenceless. Even if it’s just symbolic solidarity, it’s inspiring to see art spread across three different Arab countries in solidarity with Syria. And this is just the beginning. 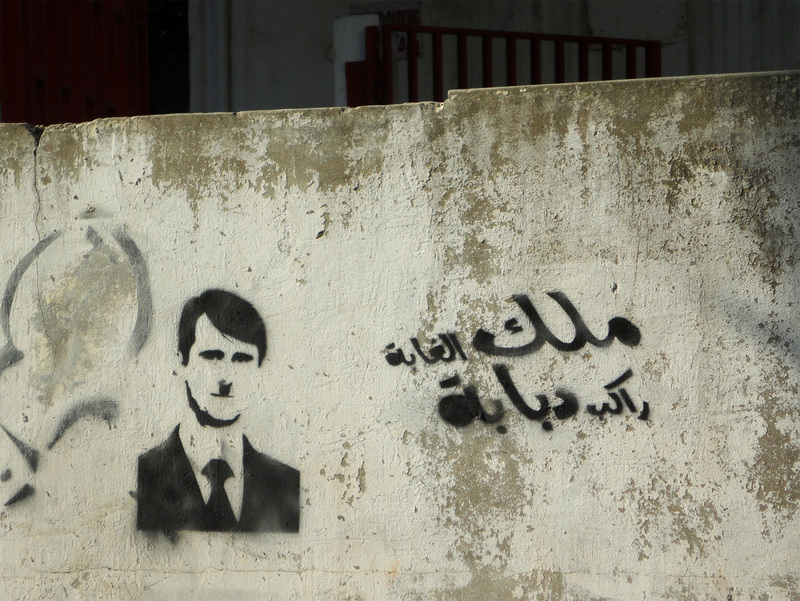 Soon, the Bashar stencil will appear in Tunis, and Syria, its most perfect position. Then maybe Europe. Who knows how far an idea can travel? I hope that Syrians hear about the stencil. It’s tiny and irrelevant compared to the severity of the situation in their country, but it’s uplifting to believe that a message of Arab solidarity can transcend borders and futile governments. This entry was posted in Street Art Fascination and tagged Bashar El Assad, Beirut, Cairo, Cairo street art, El Hamra, El Teneen, Gaza, Gaza Walls, Hama, Hitler, King of the Jungle, Lebanon, Malek El Ghaba, Middle East, Palestine, protest, protest graffiti, Riding a tank, Syria, Tank, wheel of productivity. Bookmark the permalink. Hurrah and nice post, but Syria and Egypt’s “democratically elected rulers”..? Mashallah on the Muslim solidarity, from Cairo , to Bierut and Gaza. Too bad Graffiti is haram and all these artists are going to hell, but its a nice gesture. What the??? Where did you get that from? And you don’t go to hell for spraying a bit of graffiti. Amazing post! We thank those who stand for justice and peace and stand in solidarity with those being oppressed. they, the regimes, scared from the walls!! Is “the morally conscious Western governments” meant to be sarcastic too? sigh. i guess my sarcasm is too subtle. should i use quotation marks next time? It’s just that even after London riots many still believe that Western governments are more ethical than ours. right, because the UK government ‘didnt’ just declare war on social media and cut BBMs. Thanks for a good post- I wonder if this was only in Hamra, or if it appeared elsewhere in Beirut. When I was there in April there were a lot of Assad supporters in the neighborhood. I really like this specific 1, “Protest Graffiti: Solidarity with Syria Spreads from Cairo | suzeeinthecity” the best.